Looking back even farther than last week… I must have been in college!? Unbelievably, in a week, my mom will have been gone for nine years… but she made me laugh the other day! I can still hear her voice! Left to right, my mom, Jerri Underwood Burton; me! 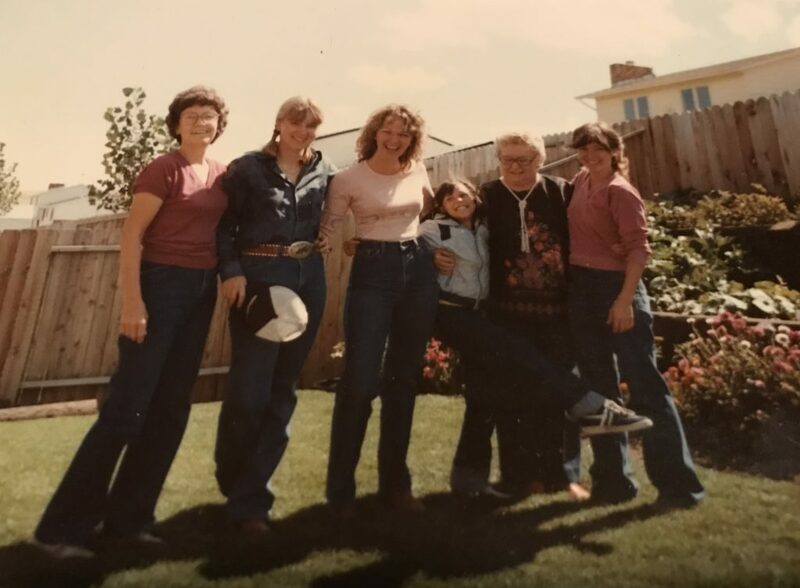 (In pigtails and baseball cap); my sister-in-law, M. Burton, my niece, L. H. Burton; my grandmother, Lila Underwood; and my sister, D. Burton. All I can say is, dang! I was skinny! That was a long time ago! Thanks for sharing this fun photo. Very interesting! I will always miss your mom! She was indeed my best friend! This is an interesting picture — I guess we all have changed although at college age we never thought we would. Thanks for all the interesting things you share.